Wooden Rustic-Style Thin Gold Line American Flag It's your voice in the darkness that gives hope to those who need it. 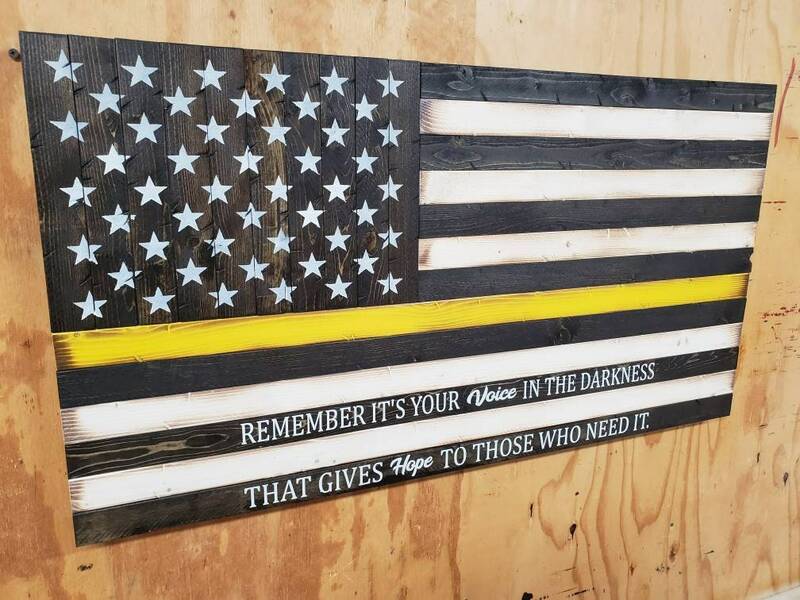 Wooden Rustic-Style Thin Gold Line American Flag "It's your voice in the darkness that gives hope to those who need it." Measures approximately 19"x37". D-rings are attached for easy hanging. All of our items are made using new wood that is distressed by hand for our unique look. The wood is stained and the wording/stars are painted on. A clear coat is applied for a beautiful finish. The matte finish has very little shine that give a more rustic look and the gloss finish has a high amount of shine that makes the colors stand out more.